[134 Pages Report] The global IoT for public safety market size was valued at USD 851.3 million in 2017 and is projected to reach USD 2,045.0 million by 2023, at a Compound Annual Growth Rate (CAGR) of 15.9% during the forecast period. The base year considered for this study is 2017, and the forecast period is 2018–2023. The key objective of the report is to define, describe, and forecast the IoT for public safety market size by component (platform, solution and services), application, vertical market, and region. The report provides detailed information on the major factors (drivers, restraints, opportunities, and challenges) influencing the growth of the market. The report attempts to forecast the market size with respect to 5 major regions, namely, North America, Europe, Asia Pacific (APAC), Middle East and Africa (MEA), and Latin America. It strategically profiles the key market players and comprehensively analyzes their core competencies. The report also tracks and analyzes competitive developments, such as partnerships, agreements, and collaborations; mergers and acquisitions; and new product developments, in the market. The IoT for public safety market consists of vendors providing platform, solution, and associated services including system integration services, consulting services, and support and maintenance services to commercial clients across the globe. Major players in the IoT for public safety market include IBM (US), Hitachi Vantara (US), NEC (Japan), Microsoft (US), Cisco Systems (US), Nokia Networks (Finland), Sierra Wireless (Canada), Telit (UK), and West Corporation (US). The other players include ThroughTek (Taiwan), Iskratel (Slovenia), IntelliVision (US), Star Controls (US), Carbyne (Israel), Securens (India), SmartCone Technologies (Canada), Kova Corporation (US), Esri (US), Cradlepoint (US), Endeavour Technology (Ireland), X-Systems (Netherlands), Yardarm Technologies (US), Tibbo Systems (Taiwan), CityShob, and SayVu Technologies (Israel). These leading companies have adopted new product launches and partnerships, agreements, and collaborations as the key growth strategies to improve their services and provide better solution and associated services to expand their market reach. The study answers several questions for the stakeholders, primarily, which market segments focus in the next 2 to 5 years for prioritizing efforts and investments. 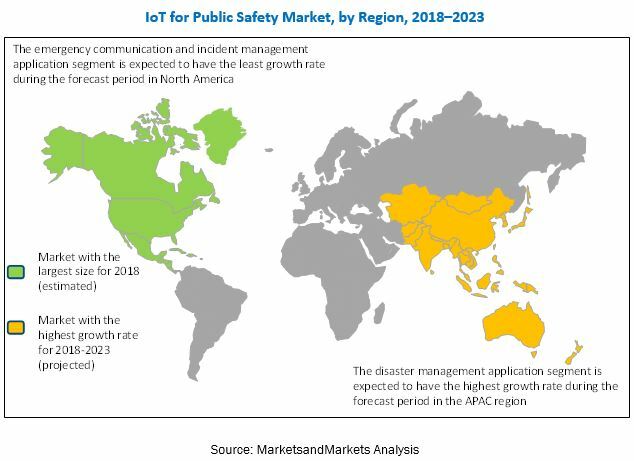 MarketsandMarkets forecasts the global IoT for public safety market size to grow from USD 979.0 million in 2018 to USD 2,045.0 million by 2023, at a Compound Annual Growth Rate (CAGR) of 15.9% during the forecast period. The IoT for public safety market is segmented on the basis of components (platform, solution, and services), applications, vertical markets, and regions. IoT is revolutionizing the public safety by offering reliable and secure communication to the first responders and citizens. As public safety and security is the priority of the governments across the world; they have to ensure the safety of citizens, organizations, and financial institutions from external threats. They heavily rely on the public safety and security solutions, such as surveillance systems, communication networks, and biometric & authentication system, to safeguard the lives of citizens. In this scenario, reliable IoT platform and solutions play a vital role to offer advance safety and security smart devices, applications, and critical communication networks to safeguard citizens in case of critical emergencies. The platform segment of IoT for public safety market includes device management, application management, and network management. The IoT platforms enable central monitoring and control of each activity that takes place in organizations across the verticals. In the public safety arena, the IoT platform integrates reliable public safety and security solutions, and empowers legal bodies of cities to achieve the goal of public safety to safeguard citizens in case of emergencies. The application segment comprises various applications such as emergency communication and incident management, critical infrastructure security, surveillance and security, and disaster management. Among them, the surveillance and security application is one of the major application areas of the IoT for public safety, which holds a significant share in the overall IoT for public safety market. Surveillance and security systems include several types of surveillance cameras, monitors, storages, and surveillance software, such as video analytics and video generic applications, and IoT platforms. The IoT platform collects the data from these devices, analyzes the data, and provides this data to public safety agencies for preventing and responding in emergency situations. Services are evolving as an important aspect, as IoT for public safety vendors offer integrated services packages, along with application software packages to their commercial customers. Services are evolving as an important aspect, as vendors are offering integrated services packages, along with their public safety platforms and solutions. The services segment of the IoT for public safety market is broadly categorized into 3 segments, namely, system integration services, consulting services, and support and maintenance services. The public sector, including governments and law enforcement bodies, has realized the importance of IoT for public safety solutions and its associated services to overcome the safety and security challenges faced by citizens in cities. The IoT for public safety by vertical covers smart building and home automation, homeland security, smart utilities, smart healthcare, smart manufacturing, smart transportation, and others (smart retail and smart education). The IoT for public safety solutions help avert and minimize the impact of terrorist attacks, cyberattacks, and natural disasters on the economy. Many states around the world have public safety departments and agencies whose primary responsibility is to deploy IoT public safety solutions to protect the public and limit the effects of the criminal attacks and natural calamities. The citizens are usually dependent on the government and public departments for their day-to-day safety and security requirements. Furthermore, people have started demanding for effective responses to all types of crises by public sector safety agencies. North America is expected to account for the largest market share and dominate the market during the forecast period. The region is witnessing emerging trends, such as IoT and smart cities which have made public safety agencies, government bodies, and enterprises realize the significance of IoT for public safety solutions and services. Asia Pacific (APAC) has witnessed an advanced and dynamic adoption of new technologies and has always been a lucrative region. The IoT for public safety market in APAC is expected to grow at the highest CAGR during the forecast period. APAC is also highly focused on smart cities projects, which is driving the demand for public safety solutions, such as surveillance systems, advanced cameras, scanning and screening systems, and high-tech communication networks. Budget constraints for deploying smart devices is expected to be one of the restraining factors for the growth of IoT for public safety market. 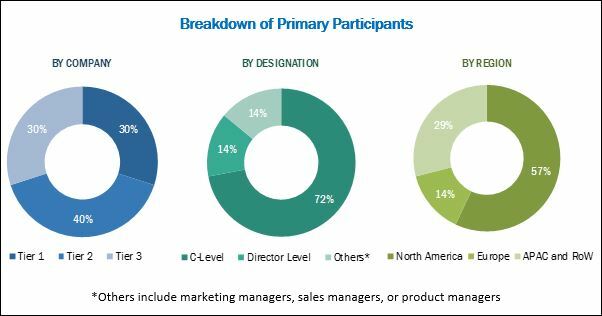 However, recent developments, new product launches, and mergers and acquisitions undertaken by the major market players are expected to boost the market growth. The study measures and evaluates key offerings and strategies of the major market vendors, including IBM (US), Hitachi Vantara (US), NEC (Japan), Microsoft (US), Cisco Systems (US), Nokia Networks (Finland), Sierra Wireless (Canada), Telit (UK), and West Corporation (US). The other players include ThroughTek (Taiwan), Iskratel (Slovenia), IntelliVision (US), Star Controls (US), Carbyne (Israel), Securens (India), SmartCone Technologies (Canada), Kova Corporation (US), Esri (US), Cradlepoint (US), Endeavour Technology (Ireland), X-Systems (Netherlands), Yardarm Technologies (US), Tibbo Systems (Taiwan), CityShob, and SayVu Technologies (Israel). These companies offer reliable IoT for public safety platform, solution, and associated services to commercial clients across regions.